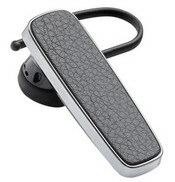 A new wireless headset for your BlackBerry smartphone, BlackBerry Wireless Headset HS-700 has been announced by RIM. With this BlackBerry accessory you can place a call, swap between calls, mute a call, redial, check battery status, and pair to another smartphone all with a simple voice command. HS-700 will tell you the name of an incoming caller when paired with a BlackBerry 6 smartphone. No address book transfer to the headset is required, as the HS-700 stays constantly in sync with your BlackBerry smartphone. For BlackBerry smartphones not running BlackBerry 6, the HS-700 will announce the phone number of the incoming call. The BlackBerry Wireless Headset HS-700 also supports voice commands. One other cool voice command is the “call last” command. It will call back the last person who called you while the headset was connected. BlackBerry HS-700 Bluetooth Headset works with GPS mapping apps on your BlackBerry smartphone to provide turn-by-turn directions in your ear. In addition to the advanced noise cancellation features in the HS-700, you might notice there’s no volume controls on the headset. That’s because the HS-700 will adjust the volume level automatically whether you’re walking down a noisy street or in a quiet office cubicle. 0 comments on "BlackBerry HS-700 Bluetooth Headset announced"